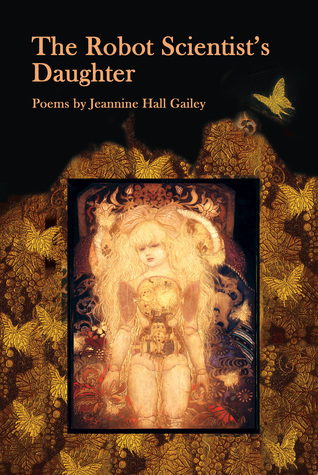 In conjunction with Poetic Book Tours and the 2015 National Poetry Month Blog Tour, Jeannine Hall Gailey agreed to be interviewed about her poetry, including her new collection, The Robot Scientist’s Daughter. I’ve read her poetry for several years, and I just cannot get enough. I hope that you’ll not only check out her interview below, but also her April book tour. A few of your collections — Becoming the Villainess and Unexplained Fevers — have reinvented and breathed new life into beloved heroines, myths, and fairy tales. How do these stories inspire you to create the vivid and unusual narratives in your poems? Which are some of your favorites? At the time I was writing Becoming the Villainess, I was particularly interested in Ovid’s Metamorphoses and the story of Procne and Philomel, and more unusual fairy tales, such as the story of the French fairy Melusine, which I fell in love with after researching it after reading A.S. Byatt’s Possession, and the story of “the coat of thousand furs,” or Allerleirauh. I was not interested in the Disney versions of the fairy tales, as I knew even as a kid how much they differed from their Grimms’ origins, but I did enjoy sort of tweaking the clichés of those films. Then of course I got really interested in Japanese folk tales a few years ago, when I was writing She Returns to the Floating World, and researched and found as many of them translated into English as I could. I loved the ones that focused on older sisters rescuing younger brothers, which is quite a common trope in Japanese folk tales, and of course the tales of transformations of women into foxes, cranes, peonies, etc. There are so many interesting tales out there. I also love Hans Christian Andersen’s “The Snow Queen” – it’s a fascinating, complicated, and unexpectedly feminist piece of work. I love re-working those characters. Unexplained Fevers actually centers on the fairy tale characters I neglected in my first book, because I felt that they were too passive. But after reading the Snow White/Rose Red references in Haruki Murakami’s After Dark and the Rapunzel narratives in Osamu Dazai’s Blue Bamboo, I started thinking about how I could re-write characters like Sleeping Beauty, Rapunzel, and Snow White – and that’s how I started writing that book. In your new collection, The Robot Scientist’s Daughter, your subject matter is a little more concrete, including but not limited to the history of nuclear development, family, and nature. How did this collection come to be and did you find the process easier or more difficult compared to previous collections? I think a seed for this collection was planted when I was working with Dorianne Laux at the Pacific University MFA program some years ago, and she encouraged me to write more about my own life. I considered my life too boring to write about. And Ilya Kaminsky, I remember, told me after reading my first couple of books that “now is the time for you to create your own fairy tale.” I held on to both of those things, but it took me a while to figure out how to incorporate my own experience into poetry. The Robot Scientist’s Daughter was born in the series of “elemental” poems in the book—poems like “Cesium Burns Blue,” “Radon Daughters,” and “Elemental,” —and then I started thinking about ways to create a character that was like me but was not—and I came up with the Robot Scientist’s Daughter character. Those are more fantasy and sci-fi-based poems, and therefore more familiar to me and fun to write. The straight-up history/autobiography poems were probably the hardest to write—Oak Ridge’s history is fascinating—even the Wikipedia entry can sound like a weird prose poem—but making that history sound poetic was something I struggled with. I did include a series of poems about my childhood that were not as fun to write, but I wanted something that would give the reader sort of a child’s-eye view of the beautiful, mysterious nature of growing up on a farm in Tennessee, not just the “atomic history down the street” part. Nuclear research, energy, and bombs are dangerous but yet humanity continues to engage in these activities despite the lasting risks. In “They Do Not Need Rescue”, the poem discusses the silence surrounding the consequences of these activities — that the people living nearby Oak Ridge National Laboratory signed away their family’s lives for a meager paycheck and a house — and it raises questions about why they would remain silent even years later and not speak out. Is it a question of fear vs. bravery, or something more? I can’t really speak for the people who made those decisions, which are individual to each of them. But I do know that the contracts for people that work/worked at ORNL – a huge source of lucrative jobs in a region that even now doesn’t have a ton of great jobs – were pretty prohibitive and threatening, and people in that area signed a contract and stuck with that agreement. If they don’t feel comfortable speaking out today, it’s probably because of the wording of the contracts they signed. I don’t want anyone to get the impression that the people of Oak Ridge are victims – they certainly don’t think of themselves that way – and there’s a culture in Eastern Tennessee of individualism, hard work, patriotism, and a tendency towards the taciturn rather than the loquacious. Also, the dangers of radiation were not really well known early on in the work of ORNL – as reading some of the memoir of one of Oak Ridge’s early “Safety Physicists”, The Angry Genie, would indicate. In the beginning, they were focused on winning World War II, getting the bomb before the Nazis, and not as worried about pollution and those kinds of “down the road” problems. There was a little bit about how they taped uranium to the wrists of some of the nurses there, to see the effect; I mean, they were very naive back then. The Chernobyl and Fukushima disasters, for instance, indicate that even today, how little prepared most companies and countries are for the kinds of problems that can happen with nuclear disaster, how little they understand the magnitude of something like nuclear pollution, how it stays around for multiple human lifetimes. It’s something to keep in mind as our nuclear power plants age here in the United States. Writing is a solitary endeavor for many authors. How do you maintain contact with the outside, and how does that differ from the experience of reading your work aloud for an audience? I’ve belonged to a writing group for thirteen years, and that really helps. Also, Seattle and the surrounding cities have great writing communities. I volunteered with several terrific local journals for many years, which is also a great way to stay connected with the writing community—currently I’m on the Board at Crab Creek Review. Writing itself is work that must be done alone, but sharing it, getting it published, dealing with rejection, applying for grants or residencies—all those parts of the writing life really benefit from the help/encouragement of other writers. I also enjoying teaching, editing manuscripts, and a new venture—helping poets with PR for their books! I absolutely root for every single student and editing client to succeed! I also think social media – Blogs, Facebook, Twitter, what have you – can really help you feel connected to the larger writing world in a way that just wasn’t possible when I was a younger writer. A lot of people hate them, but I absolutely think they are a gift (even if I haven’t exactly figured out how to be the greatest Twitter-er or anything yet.) You can see when different magazines have a call for submissions, or congratulate a friend on good publishing news, or follow writers you admire. I mean, you can’t spend all day on that stuff, but it’s great on a rainy Sunday to go to the Twitter #poetparty, for instance, and say hi to some writing friends and feel encouraged. What poets you’ve read are making a difference with their poetry, either trying to influence societal, environmental, or political change? What other poets should we be reading? For the first question: There are really so many! I think probably Carolyn Forché, Alicia Ostriker, Margaret Atwood, Pattiann Rogers, Sandra Alcosser, and llya Kaminsky have all been particularly influential in terms of the way they write their activism. But I am so excited about reading the younger generation’s take (do I sound super-old there? But it’s true!) on issues like racism, feminism, the environment, immigration—I feel that younger writers right now are unafraid of taking on big ambitious subjects than my generation was/is. Another few poets that I think tackle difficult and thought-provoking political subject matter with imagination and empathy: Jericho Brown, Eduardo C. Corral, Saeed Jones. For the second question: There are so many good poets here in the Northwest that I think don’t get enough attention – in particular, I’d like to champion the first books by poets Annette Spaulding-Convy and Natasha K. Moni, which are both exceptional. And we have a wonderful group of female poets up here, people like Kelli Russell Agodon, Kathleen Flenniken, Kelly Davio, Elizabeth Austen, Martha Silano, Jenifer Lawrence, Marjorie Manwaring. They’re not just great poets, they’re great people who put time and energy into their poetry community. I love the work that my friends at local press Two Sylvias Press are putting out, too – definitely worth taking a look at. I discover great poets out here all the time, people I’ve never met that I’ll happen to hear at a reading. I try to highlight books I love in my reviews for places like The Rumpus, too. Reviewing is still something I try to do on a regular basis, especially for books that might otherwise get overlooked. Anything to bring more love to poetry! Thanks, Jeannine, for sharing your thoughts with us and your poet recommendations. These poems will definitely make you think deeper about nuclear research and the effects of not only disposing of waste, but also the impact of atomic bombs and nuclear meltdowns. Some of Gailey’s signature references to comic book characters and myths are present in these poems if you know where to look, like Dr. Manhattan who found himself transformed by an accident in a lab — an accident that resembles one caused by physicist Louis Slotin — and his modified outlook on humanity, which resembles the attacks of conscience felt by Oppenheimer. While there are references to the Manhattan nuclear project, the bulk of the collection focuses on the Oak Ridge National Laboratory in Tennessee. of ranch houses burned into the ground. Like most young girls, our narrator tries to fit in, which is hard in a secretive community where the government has sought waivers from its workers and those living and working in the community cannot speak to anyone about the research being done. Even children get a sense of being cloistered, being penned in. While some poems are about the past and the nuclear research at the Tennessee labs, some poems take a more recent approach in examining the fallout from the Fukushima disaster, the direct result of a earthquake-generated tsunami. From butterflies born without eyes to the beautiful disaster that is the art of an explosion, the poet calls into question human curiosity and the vanity that sometimes comes with that, in which the scientist believes only good will result from research and experiments, despite historical evidence to the contrary. The Robot Scientist’s Daughter by Jeannine Hall Gailey has a gift of putting the bigger questions into a more manageable world within her poems. From “They Do Not Need Rescue,” “No one needs rescue here in America’s Secret City./…/Not the children/dying of leukemia quietly in hospitals funded/by government grants, uncounted because/their numbers might seem damning.//” We want to bury our sins and hide from the truth, but it cannot be secreted away, no matter how hard we try. Jeannine Hall Gailey is the Poet Laureate of Redmond, WA and the author of Becoming the Villainess, She Returns to the Floating World, and Unexplained Fevers, available spring of 2013. Her work has been featured on NPR’s The Writer’s Almanac, Verse Daily, and The Year’s Best Fantasy and Horror. Her poems have appeared in The American Poetry Review, The Iowa Review, and Prairie Schooner. She teaches part-time at National University. 1. The Robot Scientist’s Daughter by Jeannine Hall Gailey for review.